Steve Bibas, CPA, is a Partner and a member of the Accounting & Auditing Group at Gettry Marcus CPA, P.C. 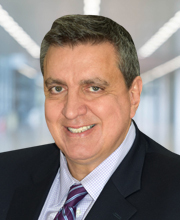 He has over 30 years of experience and is responsible for overseeing the annual audits and reviews for a diversified clientele in the real estate, manufacturing, transportation, construction, importing, printing, chemical and healthcare service industries. Mr. Bibas also conducts due diligence procedures for potential client acquisitions. He presently manages a team of accountants who provide the bookkeeping, accounting, and tax and investor relations services for a group of public and private partnerships. Mr. Bibas received his B.B.A. in Public Accounting and his M.S. in Taxation from Bernard M. Baruch College, N.Y. He is a member of the American Institute of Certified Public Accountants (“AICPA”) and the New York State Society of Certified Public Accountants (“NYSSCPA”). He is also active in the firm’s Continuing Education program.